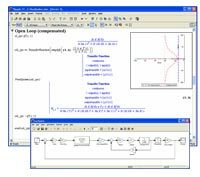 BlockImporter is a Maple add-on that allows you to import a Simulink® model into Maple and convert it to a set of mathematical equations. It can then be analyzed, optimized, simplified, turned into a MapleSim custom component for inclusion in MapleSim, and exported back to Simulink® using the MapleSim Connector. This conversion enables the user to validate the mathematical integrity of the model, perform further analysis, document the system, eliminate algebraic loops, and increase Simulink® execution speed. Frequently, engineers get Simulink® models that were developed by other groups or external organizations, and the first step in adopting these models is to ensure their correctness before extensive simulations are performed. Pulling apart and validating these complex models can be a difficult, manual process. BlockImporter allows you to import system and subsystem models and study the underlying mathematics in a meaningful, fully understandable form. You can also test the behavior of the model by running simulations and parameter sweeps. See the full list of supported Simulink® blocks. Sometimes an engineer is forced to reduce the fidelity of the model to ensure sufficiently fast execution speed, such as for real-time applications. With BlockImporter, you can use the power of Maple’s symbolic and numerical math tools to simplify the model so that it requires less time to execute, without losing model fidelity. Techniques include eliminating algebraic loops and DAE index reduction. These simplifications can result in significantly increased execution speed without losing model fidelity. With BlockImporter you can work with fully parameterized versions of your models that allow you perform powerful analyses, such as frequency-, and complex-domain analysis, stability and sensitivity analysis, parameter optimization, and much more. Once your model is imported into Maple, you can include text, illustrations, plots and other supporting information that documents the development and analysis of your model. This is very useful for auditing purposes and minimizing rework in future projects.